When you think of superheros, who comes to mind? The Marvel or X-Men characters - Batman, Superman, Iron Man, Thor? Or, do you consider a superhero to be someone who is ordinary but puts their life on the line? I could use a superhero, to save me from....a burning building, a one-eyed, one-horned monster, insanity, having to do dishes, or even piled up laundry. My 23 yoa daughter is a big fan of Batman and her apartment looks like a teenage boy's dorm room with all the superhero collectibles and knicknacks. To help young fans everywhere enjoy the SUPER day, check out the special PJ Masks Official Hero Celebration Kit, featuring downloadable PJ Masks party invites, decorations, character masks, activity sheets, and more. 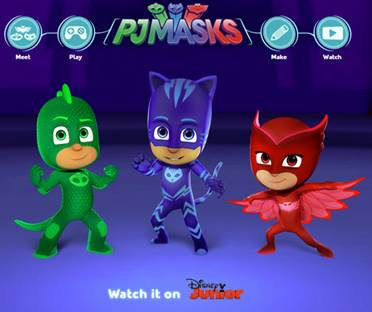 Get in on all of the heroic fun with Catboy, Gekko and Owlette. If you could have a special superhero power, what would it be? Reminds me of 9-11 when my superhero fanatic grandson was 4 and saw a picture of Bin Laden on the front page of the paper and stated: "That is the bad man who crashed planes into buildings and there weren't any superhero's to save us!